The Liverpool is a pub I'd never been to before until yesterday. It's located nextdoor to James St station. I'd heard some fairly negative reports about the place. So I found it much better than I had expected. Whilst there's no real ales here, the keg selection was reasonable, including a couple of beers from Caledonian - Three Hop & Rare Breed. The interior is fairly dark with a nautical theme. There were a couple of TVs showing live football. Staff were fairly friendly too. 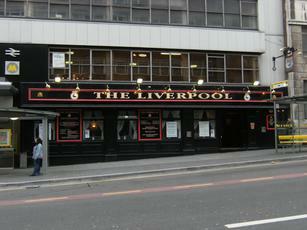 I probably won't return, with so many decent pubs in Liverpool. One of my fav pubs ever. Always look forward to having a few scoops on my visits to the City. Try the Scouse they dish up....its the best. Another visit after a couple of years away and still one of the better Liverpool wateringholes. Recommended. Fantastic atmosphere. Wonderful mixed clientele. Friendly and fun. Good service. Clean and plentiful toilet facilities. Excellent live entertainment. This place has it all ! During my journey in Liverpool i was four times in this pub: good food and drink, very kind the people and the cooker was a fantastic surprise for me. I'll never forget his "hi fellow!!" at the second time he saw me.